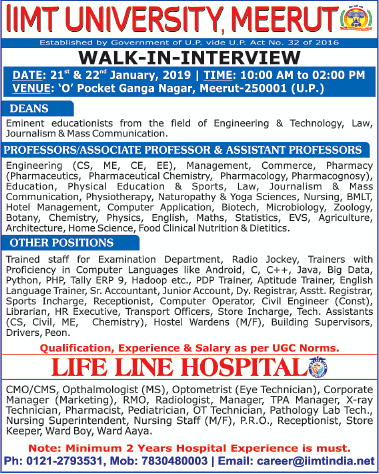 IIMT University, Meerut has advertised in THE TIMES OF INDIA newspapers for the recruitment of Teaching Faculty- Professor / Associate Professor / Assistant Professor / Dean Plus Chartered Accountant jobs vacancies. Interested and eligible job aspirants are requested to walk-in on 21st and 22nd January 2018. Check out further more details below. About University: The foundation of this magnanimous institute was laid in 1994. The sapling has been gaining strength and vitality with the outcome that today IIMT stands as the most beautiful and fragrant blossom of Northern India imparting quality education. How to Apply: Eligible and interested candidates are required to attend the Walk-in interview along with their latest CV with Photograph, all originals & copies of certificates to the walk-in address mentioned below.